Kamehameha-Hawaii's Isaiah Kekaualua, left, will be asked to handle a bigger load this season. To the unfamiliar, a No. 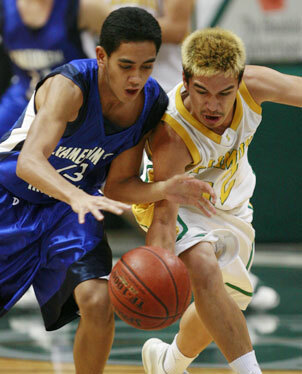 6 ranking for Kamehameha-Hawaii in the Star-Bulletin Boys Basketball Top 10 seems odd. For fans who know better, it is a fair place for the Keaau-campus Warriors, who have been a top-five team in recent years. Last year's group, guided by senior Mea Wong, reached the state semifinals before falling to Punahou. This year's squad has a wealth of talent and experience, but coach Nelson Wong hesitates to put his team at the same level as last season's team. For now, anyway. "We're flattered. Actually, members of last year's team should be even more flattered because this ranking is probably the byproduct of the performance of last year's team, as well as what people perceive of the players that we have coming back." 2006-07 record: 26-8 (15-2 BIIF). On paper: The Warriors lost a true floor leader in Mea Wong. Reece Alnas was a great athlete on the perimeter, and Keli'i Kimi was a steady contributor in the paint. Graduation cost the Warriors all three, but the posse of talent still on campus is what voters point to when casting their ballot. Isaiah Kekaualua (5-foot-11) is a smooth guard who can break down fullcourt pressure. Kealoha Kramer (6-0) is steady on the low post, and Colton Collins (6-1) is a sure mid-range shooter. Hogan Rosehill (6-0), a multi-sport standout, is a bruiser who also brings a finesse game around the basket. Russell Kackley, a 6-5 center, rounds out an impressive senior class. Newcomers Kawika Cazimero (5-10) and Kulani Soares (6-2) will also contribute. The skinny: In what was once a run-and-gun league, Wong brought plenty of halfcourt patience and execution to the hardwood. The Warriors of recent years have been more apt to win by single digits than by 40. That controlled tempo has served them well in tight state-tournament games. Still, Wong isn't locked into a single style of play. "Maybe we'll run a little more. Maybe open things up a little on offense. We'll see," he said. Execution was dependent, to a large extent, on Mea Wong's floor leadership. "This year, we have leadership by committee," Nelson Wong said. X factor: The notion of league championships as a tradition is still something new for the young program. However, Wong likes the fact that this group of seniors is practically bred in blue and white. "This year's senior class is the first that has come through our program all the way from middle school," he said.